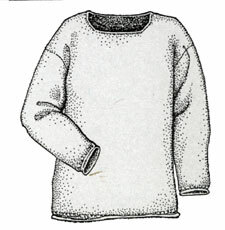 Emilia Bruce, a friend of the Spinnery, based the design for this pullover on the loosely fitting tunics she wore during her childhood in Spain. A perennial favorite for men and women alike, it is simply knit with a garter stitch yoke and trim. For a contemporary look, the crocheted neck edge can be replaced by a roll neck.